See what I did there? In the title? Sic transit! In a post about my car! Bah, whatever. That’s about all the humour you’ll get in this post. Consider yourselves warned. SPOILER ALERT: I’M ABSOLUTELY FINE. 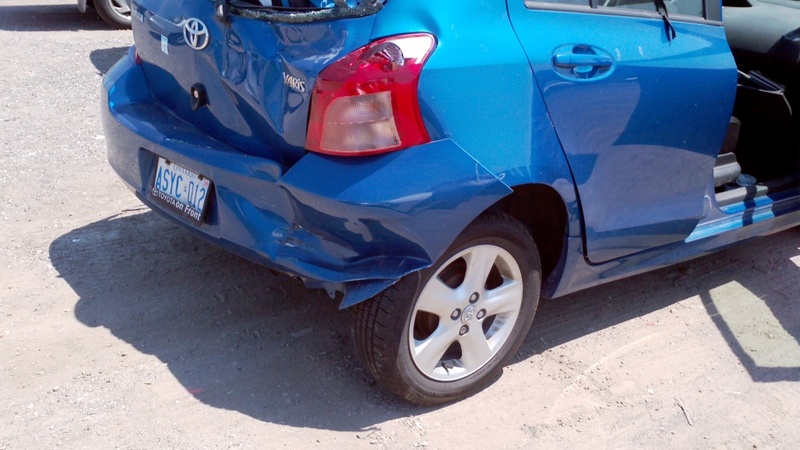 I got rear-ended on highway 401 on Friday morning. Suffice it to say that I had three options, two of which would have resulted in me rear-ending someone else, and so I took the third, which relied on another driver to be paying attention. 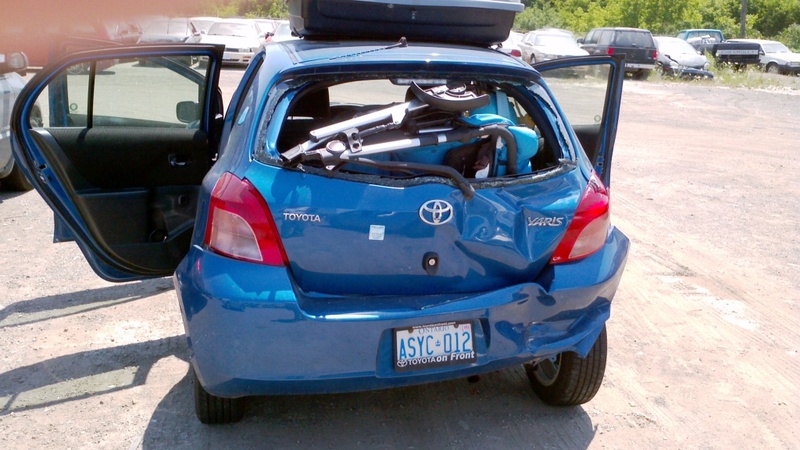 I can tell you that crumple zones really do crumple impressively. I can also tell you that people’s exhortations to put all loose items into a secured glove compartment or something similar are well-intentioned but poorly informed; all of the latched compartments in my car sprang open on impact, belching their contents all over my car. My poor, poor, car. Brace yourselves, it ain’t pretty. Yes, the impact was hard enough to break the rear windshield. 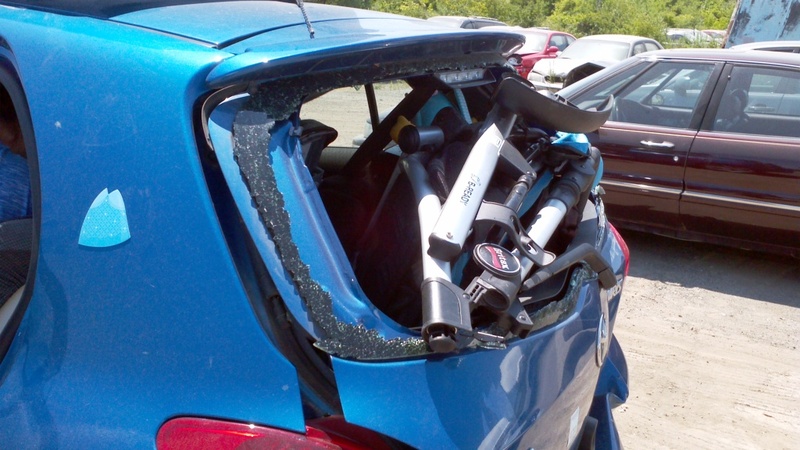 It’s obvious what happened: the stroller saw a big grey pickup truck bearing down on it and, in a moment of sheer panic, punched through the windshield in an attempt to escape. Good thing, since we couldn’t open the tailgate at all. There was probably no point in pulling it out anyhow, since the seat is now studded with tiny shards of glass. I think we’ll be getting a new stroller. Speaking of things that can’t be opened, get a load of my rear passenger side door. No amount of brute force could open this door. I’m doubly thankful that the kids weren’t in the car, because being unable to free my kids from the car is not on my bucket list. seriously. Where were the kids, you ask? Ah, the kids: the reason I was on the 401 in the first place. I was on my way back from dropping K and N off at my in-laws’ home for the day. I had big plans for the day that included some blogging, some sewing, and some napping. Oh, the plans I had! Back to the kids. They would have been physically fine. 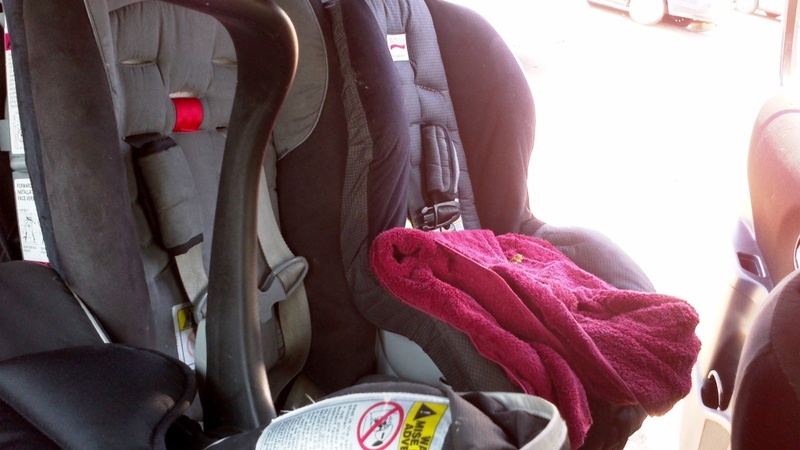 The carseats weren’t crushed or squished or anything. See? Although on second inspection they do seem to be a little… crooked, or something. But anyhow, plenty of space for the kids inside the seats, and no protruding metal or projectiles. No squished-kid potential whatsoever. Thank God. Anyhow, the first thing I did (after sighing, wiggling my toes, turning my head, and sitting completely still for two full minutes to collect myself) was call the OPP. Yeah, you know me. Oh, wait… I called the other OPP – Ontario Provincial Police. Even though I was well inside city limits, the 401 is a provincial road. Toronto police don’t have jurisdiction on the 401, apparently. That’s right, the rear wheel couldn’t turn, being blocked as it was by all that crumpled metal (or whatever cars are made of these days.) My car was rendered undriveable. And yet I walked away with only a small bruise where the lower change compartment hit my shin as it popped open (the compartment popped open; my shin did not.) I am otherwise fine, an observation which seems to baffle a great many people. 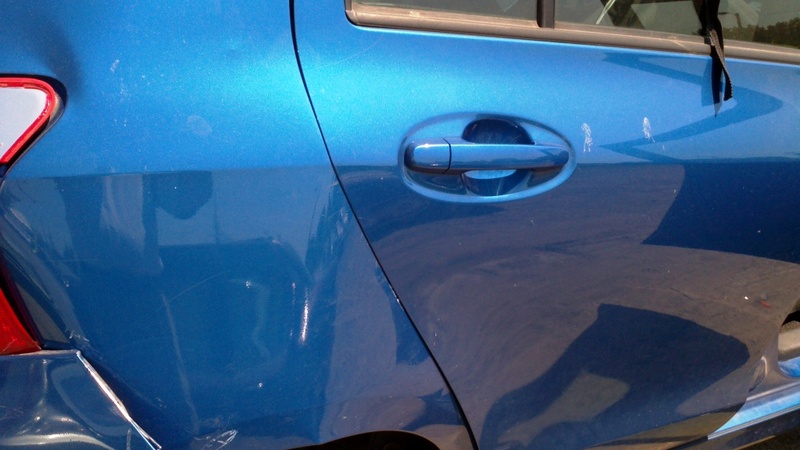 Even the guy at the auto-body shop, when I called to inquire as to the status of my car, said, “First I have to know – are you all right?” Apparently he had driven past my car on his way out of the lot on Friday and thought to himself, “Wow, somebody must have gotten hurt pretty badly.” Nope. Apparently automotive engineering is remarkably advanced. I tip my hat to the fine people at Toyota. And I thank God about fifty million times a day. Really. There are other events upon which I could elaborate: my sympathy for the other driver, who was fine but who was driving his employer’s truck on company time and was about to miss a service call, it would seem; my good fortune in getting rear-ended so close to my parents’ home on a day when my dad was still home at 10:30 in the morning; my appreciation of my dad’s ability to drop everything and come get me so I wouldn’t have to go to the collision reporting centre by myself; the extremely unimportant serendipity of having my car rendered unusable with only $4 worth of gas in the tank (as if the $50 invested in a full tank would have mattered.) I can tell you that my mother took care of R so that I could sleep in the afternoon. I still don’t know whether the insurance company will decide to fix my car or whether they’ll just call it a write-off. I do know that they won’t let us use those car seats ever again (though I’d like to harvest them for parts so that I can add some more harnesses to the Bakfiets) but won’t pay the replacement cost – they calculate 10% depreciation for every year since you bought the seat. I also know that I’m not ready to move on to another car. Our Yaris is tiny, but it has served us very well. It has hauled IKEA furniture, three dozen balloons, my mountain bike, three carseats and a double stroller, renovation materials… at times I’m convinced that it’s a pickup truck masquerading as a tiny hatchback. And yet if we had to buy a new car right now, how could I justify not buying something bigger? I have three small children who won’t always be quite so small, and our next car really should reflect that. It’s just that I’d hoped our next car wouldn’t be making an appearance for another few years yet. I love our Yaris. It’s amazing and so wonderful that you weren’t hurt! You should bentch Gomel. You do it at shul in front of 3 men or the entire minyan during the Torah reading. Oy gevalt! I’m glad you’re okay but my goodness, that car is headed straight for a junkyard, or at least it looks like it is.